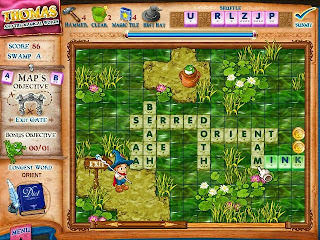 Thomas and the Magical Words from Viqua Games is a word game where you guide young wizard Thomas (now Tommy on the site, apparently) out of a magical book. Storyline is pretty thin, and the Nick Jr. style is definitely tailored for the little ones, but the gameplay is where things get interesting for us older folk. To get once-Thomas-now-Tommy out, you're given a small selection of letters and you have to build words to make a path from point A to point B. 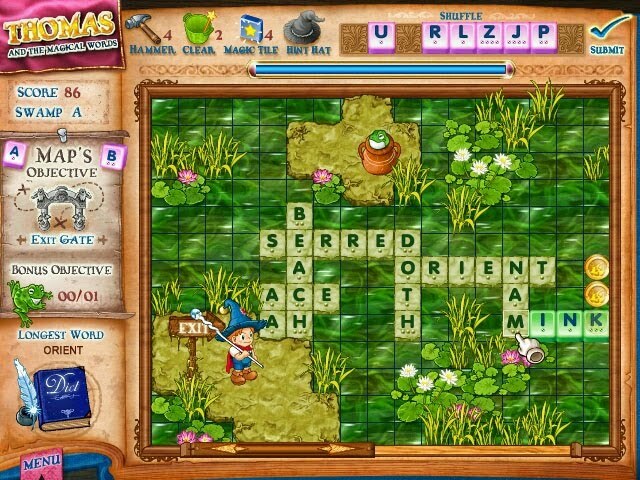 Along the way you can snag items, rescue animals, and try for larger scores by making extra paths and longer or more complex words. Speaking of which, I'm pretty sure if you could make "complex" it'd give you quite a few points. When I learned about this game four years ago, from a Penny Arcade news post of all places, I was not in any way a big Scrabble fan. Apparently, slapping a kid-friendly storyline and a single player objective on Scrabble turns the mildly entertaining board game into a dangerously addicting experience. Your game board is essentially a Scrabble board with obstacles and objectives, and I don't know why such a brilliant idea hadn't been thought of before. The difficulty curve of the game is great as well, where the little ones can learn a few things and do well in the game while the bigger kiddies (like me) have a survival mode and a high score board to challenge. If this game existed as a classroom tool when I was younger, two things would have happened. One, I would never have misspelled a word in my life. And two, I would have ignored everything else. Instead, we had Carmen Sandiego where we learned about a crappy criminal justice system that constantly let known thieves travel the country, escape capture, and never serve jail time, and Oregon Trail where we learned people traveled without clothing and died of dysentery. At least there was Number Munchers. If you wish to try out Thomas, Viqua Games has a demo and the ability to purchase the game on their site. It's six bucks now whereas I think I paid 15 at the time, but to me it was worth every penny.